Prolific Games is in their final days for Tricked-Out Hero. They've made it a bit over their funding goal, but there's always plenty of stretch goals to hopefully get through in the time remaining. Take the tricks, slay the monsters, win the Gold! 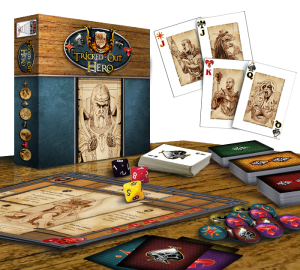 Tricked Out Hero uses a trick taking mechanic to power a monster slaying game. Deep in the nefarious dungeon lurks all manner of foul beasts. In order to delve deep for riches and fame our heroes must get TRICKED OUT!